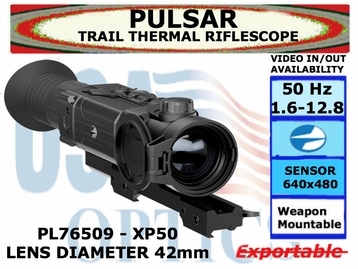 The flagship Pulsar Trail XP50 delivers vivid thermal imaging from a world-class 640x480px sensor core, offering human sized heat detection up to 1475 yards. The XP50's popular "white hot" and "black hot" modes, 13 digital reticle options, variable 1.6-12.8x magnification and 50Hz refresh rate provide users with fluid imaging, customized thermal mapping and a richly contrasted field of view. IPX7 waterproof, fogproof and dustproof, the Pulsar Trail XP50 performs flawlessly in temperatures ranging from -13° to 122°F and delivers ultra-easy user interface with ergonomic button locations. Capturing footage of your experience has never been easier with built-in video recording, 8gb of internal memory, rich 17µm pixel pitch, a frost-resistant AMOLED display and Stream Vision App compatible Wi-Fi. Proprietary picture-in-picture (PiP) ensures repeatable, precision accuracy. Additional features include a built-in accelerometer, stadiametric rangefinding, rechargeable 8-hr. battery pack, convenient carrying case and wireless remote. These devices save a lot of time and effort when hunting. There is no need to look for the traces of hunted game in the field or in the woods anymore. Whether it is daytime or night, thermal imagers will show you exactly where the animals are hiding. Great image quality gives you a chance to see even the smallest details of the animals. All these features and a lot of other useful functions make Trail one of the most remarkable innovations on the thermal imaging market. The Pulsar Trail comes in 5 versions, below is the comparison of the five.